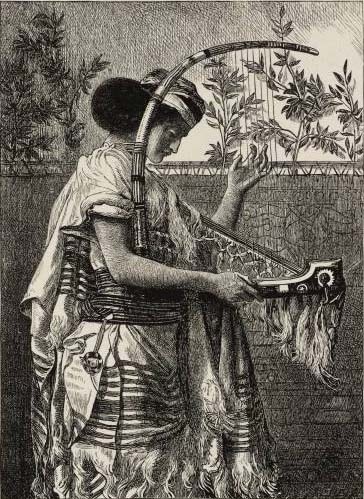 Simeon Solomon (1840-1905), "Hosanna" (1881), engraved by the Brothers Dalziel. Larger image. For thousands of years the Psalter has been a wonderful resource to enrich a person's spirit, both in public worship and in the believer's private devotional life. Though Hebrew poetry predates the time of David, he seems to be the first person we know to use psalms devotionally. 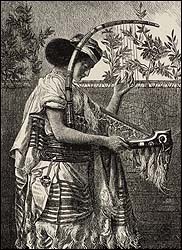 Seventy-three psalms are attributed to David, an extremely prolific poet and musician. He is known as "the sweet psalmist of Israel" (2 Samuel 23:1). I have no doubt that under the inspiration and guidance of the Spirit he composed psalms as a shepherd, on the run from Saul, and later as king. Throughout his life he would sing and compose, and in the process rejoice in his God. This passage is followed by a psalm that presumably David had written for the occasion (1 Chronicles 16:8-36), parts of which are found in our Psalter -- Psalm 105:1-15; Psalm 94 and Psalm 106:1, 47, and 48). Temple Singers. J.J. Tissot, "The Choristers" (1896-1900), b/w image of watercolor. Larger image. Special psalms were prepared for the new month, and other occasions, the Hallel during major Jewish holidays, and psalms for special sacrifices such as the "Psalm for the Thanksgiving Offering" (Psalm 100). Though evidence is scanty, scholars believe that the institution of the Jewish synagogue developed during the exile, when worship at the temple was no longer possible. Even after the temple was built following the exile -- and rebuilt by Herod -- synagogues flourished, even in Jerusalem, the city of the temple itself (Acts 6:9). At the destruction of Jerusalem, some 400 to 500 synagogues were found in the city.3 A synagogue could be formed by as few as ten males. The synagogue was the local house of worship. Jesus attended the synagogue regularly (Luke 4:16) and taught in synagogues up and down Galilee. While psalms were used in worship services in churches, in the growing monastic movement, the practice of reciting the Psalter formed the core of the devotional practice of the community. St. Benedict (c. 480-543) developed a widely-copied rule for monasteries known as The Rule of St. Benedict (c. 530-540 AD). Among other practices it outlined the Opus Dei, the Divine Office of prayers and psalms. This liturgy consisted of gatherings of the community at eight times during the day and night with the purpose to "sanctify" the day with prayer. At these various times they would say or chant together the set of prayers and psalms designated for that day and time. In time, the Divine Office involved reciting the entire Psalter through in a single week and would require several hours each day to complete. Clergy and most religious orders in both the Roman Catholic Church as well as Eastern Orthodox were -- and are -- required to recite the Divine Office. The best-known example of this is the beautiful Gregorian Chant practiced in certain orders, going back perhaps as far as Pope Gregory (c. 540-604 AD), for which it was named. At Vatican II in the 1960s, the Roman Church revised the Liturgy of the Hours so that it now goes through the entire Psalter in one month rather than in one week, and reduced the number of required times of prayer each day. Those in the Roman Church that practice this discipline use Breviary, a set of four volumes that contain the one-month Psalter plus the prayers for each day and each feast day.9 Those living as part of a community, such as in a monastery or convent, recite their psalms and prayers together ("in choir") for at least some of services, such as morning and evening prayer. Clergy living alone recite these psalms and prayers by themselves privately. Other churches with a liturgical tradition, such as Anglican, Episcopal, Lutheran, Presbyterian, Methodist, often have in their prayer book or book of discipline a calendar to guide the faithful in Morning Prayer and Evening Prayer (Vespers). The effect of those practicing a discipline of the Liturgy of the Hours has been an immersion in the psalms and regular prayer. While it can be seen as a burden, for those who have entered into it wholeheartedly, it can be a lifetime of blessing. Isaac Watts (1674-1748), engraving by R. Newton J. Thurston. Protestant Churches, too, have a strong tradition of singing the Psalms. The Church of England, under heavy Puritan influence, sought to bring about reform by publishing a metrical psalmody that could be sung by a congregation. In 1562 John Day printed the Book of Psalms with psalm text translated by Thomas Sternhold, John Hopkins, and others. Standard metrical patterns were developed that could adapt each of the psalms to a common metrical pattern -- which would then allow the psalm to be sung to one of several standard tunes. Patterns included: Common Meter (8.6.8.6), Short Meter (6.6.8.6), and Long Meter (8.8.8.8). Various adaptations were made in Scotland, New England, etc., but the psalms were the primary focus of singing in many Protestant congregations for hundreds of years. 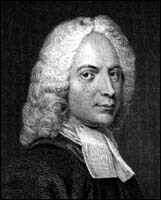 Isaac Watts (1674-1748) set a new direction for independent or congregational churches when he published his Psalms of David in 1719. Instead of close fitting translations, these hymns were poetic paraphrases of the biblical psalms. The best known of these today are probably "Our God, Our Help in Ages Past" (Psalm 90) and "Joy to the World, the Lord Is Come" (Psalm 98). The nineteenth and twentieth centuries saw a near eclipse of psalm singing in most Protestant churches in North America, replaced by devotional lyrics and gospel songs with a more emotional and subjective bent. A liturgical renewal following World War II saw a revival of psalm-singing in some churches. Vatican II (1962-65) encouraged the use of psalms in worship and fostered a wealth of "responsorial psalms." The Charismatic Renewal also brought about a huge surge of Christian music. During the 1970s and 1980s especially, singing the scriptures was common in some groups, though contemporary Christian music seems to have moved past that as a whole by the turn of the twenty-first century. Throughout history the Psalms have often been central in both corporate worship and personal devotional practice. As the psalms have remained strong, the church has been revived and personal spiritual life has been enriched. Isn't it about time to renew the ancient practice of the Psalms in your congregation and in your life? Alfred Edersheim, The Temple: Its Ministry and Services As They Were at the Time of Christ (Eerdmans, reprinted 1960, from the original facsimile published in 1874), p. 172. Edersheim, Temple, p. 172, footnote 2, cites Tamid, sec. 7, and Maimonides in Tamid. According to one legend, there were 394 synagogues at Jerusalem when the city was destroyed by Titus (Ket. 105), while a second tradition gives the number as 480 (Yer. Meg. 73d et al.). Cited by Wilhelm Bacher and Lewis N. Dembitz, "Synagogue," Jewish Encyclopedia (1906). George Foot Moore, Judaism in the First Centuries of the Christian Era: The Age of Tannaim (Hendrickson Publishers; reprinted 1997 from Harvard University Press edition, 1927), vol. 1, p. 296. Tertullian, Apology, 39.16. "Each is asked to stand forth and sing, as he can, a hymn to God, either one from the holy Scriptures or one of his own composing...."
Arthur Cushman McGiffert, The Church History of Eusebius, p. 247, footnote 14, commenting on Eusebius, Church History, 28,5, in A Select Library of Nicene and Post-Nicene Fathers of the Christian Church (Second Series), Philip Schaff and Henry Wace (editors), vol. 1 (1890). Univarsalis (www.universalis.com) contains the Breviary online with all the readings for the Liturgy of the Hours, based on the Roman Breviary 1985 edition, in a four-week cycle of the psalms. Scripture readings are from the Jerusalem Bible. Psalm translations are specially commissioned.